Are there any unused hotkey combinations in e4? I recently attended an event (Anita-Goodesign) and saw that the digitizers there use an xKeys-80 programmable keyboard with their graphics tablets. Seemed like a good efficiency thing so I ordered one. It has several drawbacks. First, it can only be programmed on a "real" Windows computer, not a virtual one (I run Parallels on Mac). Secondly, I only seem to be able to program a function to a key if the software has an assigned hotkey. I've used similar programs like this for years to add additional hotkeys and multi-step actions to other programs to improve efficiency. Are there any key combinations NOT used in e4 that I could then use some program to add them and thereby add them to my xKeys keyboard? Or are there actually hotkeys for the keys I've encircled with red that I just don't know about? Does anyone else use such a box? The scripts created when programming the boxes are shareable. I'd be happy to share mine along with the button labels I made. Replied by antony on topic Are there any unused hotkey combinations in e4? I made something similar, well, sort of. It is dynamic and interactive, and it runs on a Mac with Parallels Desktop. I might take a video to show how it works. I am currently working on another approach. 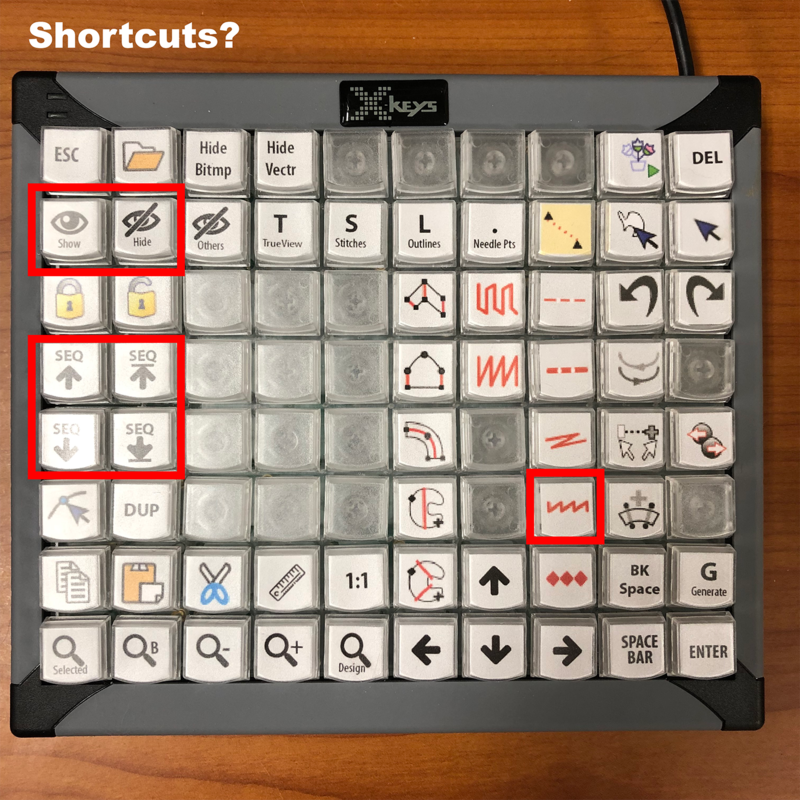 There are currently a number of functions without keyboard shortcuts still. Saying that, most of the functions I use frequently, I memorise their keyboard shortcuts automatically. Last edit: 2 months 4 weeks ago by antony. Replied by LindeeG on topic Are there any unused hotkey combinations in e4? Thanks, Antony. I'd love to know what you're using and how you're doing it. I made a spreadsheet charting all of the possible hotkey combinations and then filled in the ones used by e4. Turns out there are plenty of unused ones. It's in Excel, I'll zip it and see if I can upload it here. The fields highlighted in yellow are the ones I've assigned to the xKeys box. They won't actually work until I get the macros assigned to those items in e4. I've used Keyboard Maestro and QuicKeys for years on my Mac to perform extra actions with an added hotkey. Some of them were pretty involved. I thought I'd be able to assign keyboard shortcuts to menu items like we can on Mac but it seems you can't do that natively on Windows. I downloaded AutoHotKeys and will need to find some time to figure it out as it's not instantly intuitive. It looks doable.